The Extractive Industries are an important driver of global economic growth. They can also be a vital catalyst for national socio-economic development, especially in resource-rich developing countries and fragile states. However, given the long-term horizon of extractives projects, and large-scale mines in particular, developmental dividends for host countries can materialize with significant delays. This leads to a particular set of challenges for governments, the private sector and local communities. Understanding of the sector and the distribution of costs and benefits across the project life cycle by local stakeholders is often inadequate and related expectations are difficult to manage. Local communities are disproportionately affected by adverse impacts during construction and operation of the mine before the longer-term socio-economic benefits become manifest. In addition, the sector is rarely recognized for broader, non-fiscal contributions to national development objectives. Impartial, verified data about environmental or socio-economic impacts is difficult to obtain and the lack of transparency and access to information can exacerbate tensions and create conflict. Once trust between stakeholders has broken down and conflict erupts, re-establishing confidence and the social licence to operate is a serious challenge. Stakeholder conflicts related to extractives projects can range from damaged relationships and reputations, confrontations and project blockades to direct violence, depending on the level of cumulative grievances and pre-existing root causes. Localized conflicts can also imply major costs to companies arising from lost productivity due to temporary shutdowns or delays. Access to authoritative information is a prerequisite for building trust. However, the available data is often fragmented, inaccessible, outdated or contested. Stakeholders are often overwhelmed by the sheer amount of available information and don’t know what can be trusted to support dialogue and decision making. MAP-X, an integrated information and engagement platform for the extractives sector, developed in partnership between the United Nations Environment Programme and the World Bank, was designed to address these challenges. The innovative technology platform aggregates, authenticates, and publishes geo-spatial data on the combined impacts of extractive projects. By providing open access to impartial and authoritative data, MAP-X aims to address information asymmetries and improve the quality of evidence-based dialogue and decision making among stakeholders. 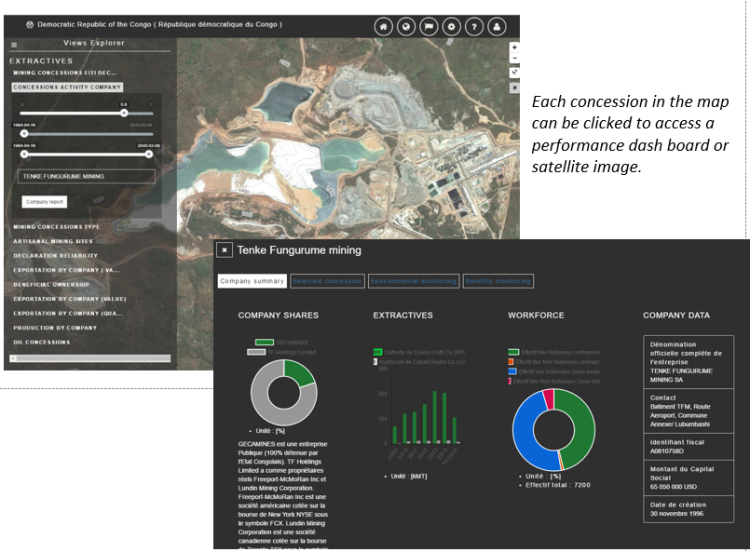 As every extractives project operates in a unique set of circumstances, the MAP-X platform can be tailored to achieve the context-specific objectives. The multi-stakeholder governance model can be adapted to a range of circumstances, while the quality control and impartiality of the platform is maintained and secured by the UN and the World Bank. By providing communities with customized access to authenticated baseline data, monitoring performance over time and tracking progress of extractives projects against measurable indicators and commitments, MAP-X can facilitate a greater understanding of the sector, improve the quality of dialogue and help prevent and mitigate conflict. For private sector stakeholders, the use and dissemination of open data can help avoid redundancies, create cost-efficiencies, demonstrate positive economic impacts of specific projects and coordination across projects. By systematically integrating spatial data infrastructure into decision making processes, government stakeholders can benefit from improved coordination across sectors. Consolidating, visualizing and publishing independently authenticated data can also help demonstrate the sector’s contribution to sustainable development. Map-X can livestream data, such as the national mining cadastre, and integrate corresponding EITI reporting data to generate heat maps. Users can either query individual concessions or add additional layers to investigate linkages between extractives and social development. 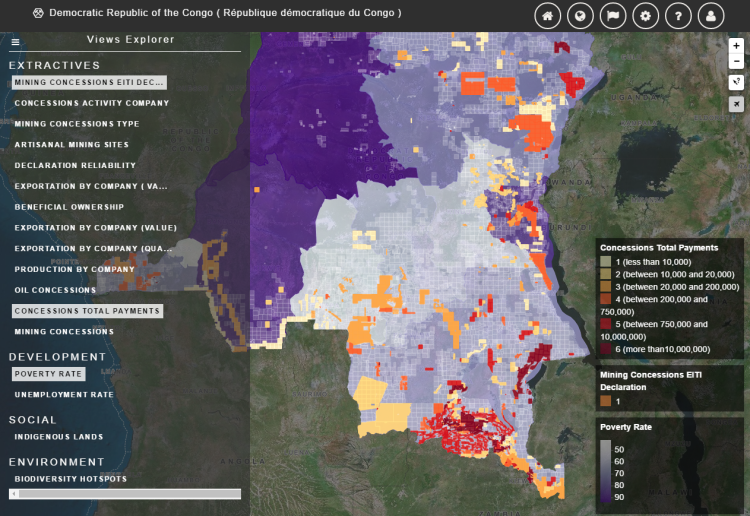 In the example above, the map shows how high concessions payments contrast with high poverty rates in Eastern DR Congo. Visualizing correlations such as this can help identify potential sources of social conflicts, inform risk assessments and support community development planning for example. Access to information does not equal trust and increased transparency does not automatically lead to greater accountability. The ability to interpret and understand the data, determine which story the numbers are telling and create actionable insights varies greatly across the community of stakeholders. With this in mind, the platform includes a comprehensive suite of tools and functionalities, including overlap analysis, local baselines and time slider functions to track impacts and land cover changes over time, user-designated areas of interest, local data uploads, map and data exports and heat maps etc. MAP-X can both stream live-data and host static data, support the visualization and help develop the corresponding narrative, all three of which are critical for successful data storytelling. In addition, the online platform can be supported by the integration of complementary services such as tailored data interpretation and analysis, capacity building of local stakeholders, production of offline outreach products, independent data sampling and analysis if data sets are contested, support to Environmental and Social Impact Assessment (ESIA) processes, and the provision of dialogue and mediation support. Companies invest heavily in data collection only for a significant portion of the data never to be used. In addition, Extractives Industries Transparency Initiative (EITI) reports, stock exchanges and other sources disclose significant extractives industries data that are rarely utilized. If effectively embedded in visuals and narrative, data becomes more memorable, persuasive and engaging, which is especially important for long-term sustainability planning and participatory decision-making. MAP-X does not only serve as a data storytelling platform, tracking and visualizing impacts over time but it can also support modelling and scenario planning to help create a shared future vision across the community of stakeholders. In this way, access to information can play a critical role in helping stakeholders gradually transition from conflict, via evidence-based dialogue to the establishment of trust. After feasibility testing and platform development in DR Congo and Afghanistan, the MAP-X platform is preparing for advanced pilot testing and implementation at site, national and global levels. A beta version of the platform is available under www.mapx.org. To provide feedback or to discuss potential opportunities for collaboration, please contact: david.jensen@unep.org or odeme@worldbank.org or comment directly on the blog.